The term “Internet of Things” (IoT) refers to a world-wide network of uniquely identifiable interconnected objects that embed sensors and actuator and can seamlessly interoperate using communication protocols. Objects of the physical world become equipped with unique identifiers (having specific identities and virtual personalities), are linked to the Internet and therefore can connect, communicate and interoperate with each other. At the same time, they can be managed using easy-to-use web applications. The number of potential IoT applications is vast, covering almost every sector of human activity. Nonetheless, the full realization of the concept of IoT still faces many challenges. The goal of this Special Issue is to collect papers presenting smart solutions to address IoT challenges, actualize intelligent IoT systems and apply IoT in smart environments. Papers should describe concepts, models, technologies, approaches, methodologies and practices of Internet of Things. 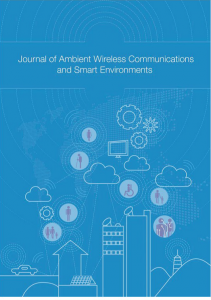 The Special Issue will collect paper submissions from open call as well as the best papers from the European Conference on Ambient Intelligence (AmI 2015).